Optimism on America's economy is fading fast. Economists have dramatically cut their forecasts for U.S. economic growth in the first quarter of 2016. Falling car sales, equipment purchases by businesses and a downward revision to consumer spending have darkened the view. The Atlanta Federal Reserve's forecast for first quarter growth is now 0.4%, a massive dial down from 2.5% in mid-February. Bank of America (BAC)'s economists recently cut their forecast to 0.6% from 2%. And Wells Fargo (WFC) slashed its estimate to as little as 0.1%, or next to nothing, rom 1.4%. These revisions come after the Federal Reserve marked down its forecast in mid-March for U.S. economic growth for the entire year to 2.2% from 2.4%. In March, total car sales fell by 1 million to 16.9 million. After an initial solid figure for retail sales in January, the Commerce Department also revised that number down a month later, dimming hopes that consumers were starting to spend. 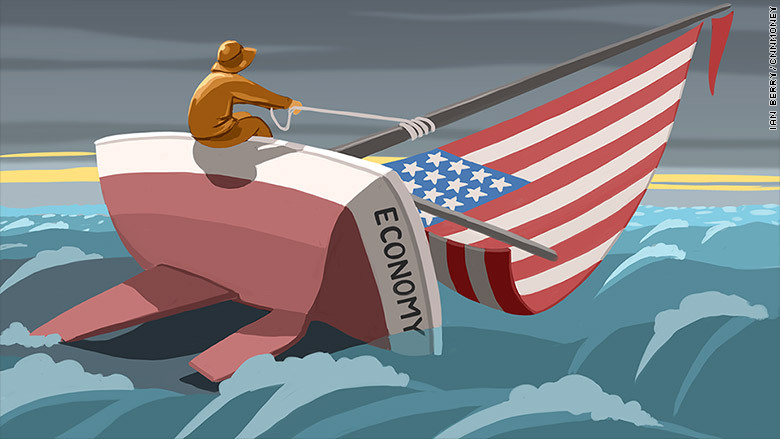 The American economy hasn't started the year right in a while. In 2014, the economy shrank 0.9%, and last year it grew a mere 0.6% in the first quarter. But the beginning of both those years were marked with harsh winter weather, keeping people inside and spending took a hit. This time is a bit different. The weather wasn't a factor this winter. Instead, consumer sentiment has fallen a bit since December, small business optimism has hit its lowest point in two years and American manufacturers are facing headwinds from the weak global economy. Earlier this year, fears of a U.S. recession grew, only to die down by mid-February and March. Those fears may now be ratcheting up again as consumers and business owners seem to be in pause mode before opening up their purse strings. We'll find out how good or bad the U.S. economy started the year when the Commerce Department releases its official numbers on April 28.